IBN ḤAMĀM (? )2 Ca. 422–428 A.H. = 1030–1037 A.D.
AL-QĀSIM AL-MA'MŪN b. ḤAMMŪD 408–414 A.H. = 1018–1023 A.D.
AL-MU'TALI YAḤYĀ b. 'ALI 412–427 A.H. = 1021–1035 A.D.
AL-MAHDI MUḤAMMAD I b. IDRĪS 438–446 A.H. = 1047–1055 A.D.
AL-'ĀLI IDRĪS II b. YAḤYĀ Second Reign 444–447 A.H. = 1052–1055 A.D.
AL-WĀTHIQ AL-QĀSIM II. b. MUḤAMMAD b. AL-QĀSIM 440–446 A.H. = 1048–1055 A.D.
AL-MANṢŪR 'ABD AL-'AZĪZ b. AL-NĀṢIR 'ABD AL-RAḤMĀN b. ABĪ-'ĀMIR 412–453 A.H. = 1021–1061 A.D.
AL-MUẒAFFAR 'ABD AL-MALIK b. AL-MANṢŪR 'ABD AL-'AZĪZ 453–457 A.H. = 1061–1065 A.D.
IQBĀL AL-DAWLAH 'ALI b. MUJĀHID 436–468 A.H. = 1044–1076 A.D.
'ABDULLĀH AL-MURTAḌĀ 468–486 A.H. = 1076–1093 A.D.
NĀṢIR AL-DAWLAH MUBASHIR b. SULAYMĀN 486–508 A.H. = 1093–1115 A.D.
AL-MUẒAFFAR YAḤYĀ b. MUNDHIR 414–420 A.H. = 1023–1029 A.D.
MU'IZZ AL-DAWLAH AL-MANṢŪR MUNDHIR II b. YAḤYĀ 420–430 A.H. = 1029–1039 A.D.
'ABDULLĀH b. AL-ḤAKAM1 430–431 A.H. = 1039 A.D.
AL-MUSTA'ĪN ABŪ-AYYŪB SULAYMĀN b. HŪD 431–438 A.H. = 1039–1047 A.D.
TĀJ AL-DAWLAH SULAYMĀN (b. YŪSUF? )1 Ca. 438–441 A.H. = 1046–1050 A.D.
'IMĀD AL-DAWLAH AL-MUQTADIR AḤMAD b. SULAYMĀN 441–4751 A.H. = 1049–1083 A.D.
SAYF AL-DAWLAH AL-MUSTA'ĪN AḤMAD b. YŪSUF 476–503 A.H. = 1083–1110 A.D.
AL-MUẒAFFAR SAYF AL-DAWLAH ABŪ-'UMAR YŪSUF b. AL-MŪSTA'ĪN SULAYMĀN Ca. 438–459 A.H. = 1046–1067 A.D.
'AḌUD AL-DAWLAH MUḤAMMAD b. SULAYMĀN Ca. 439–440 A.H. = 1047–1049 A.D.
XVII. HŪDID OF TUDELA1 AL-ẒĀFIR (?) MUNDHIR b. SULAYMĀN Ca. 439–442 A.H. = 1047–1051 A.D.
Dirhems Al-Andalus 439 A.H. = 1047/48 A.D.
'IMĀD AL-DAWLAH MUNDHIR b. AḤMAD 474–483 A.H. = 1081–1090 A.D.
SAYYID AL-DAWLAH SULAYMĀN b. MUNDHIR1 In Denia: 483–485 A.H. = 1090–1092 A.D. In Tortosa: 483–ca. 492 A.H. = 1090–ca. 1099 A.D. ANONYMOUS (Banū Ṣumādih) Ca. 435–443 A.H. = 1041–1052 A.D.
AL-MU'TAṢIM BI'LLĀH ABŪ-YAḤYĀ MUḤAMMAD b. MA'N 443–484 A.H. = 1052–1091 A.D.
AL-MUTAWAKKIL 'ALA'LLĀH ABŪ-ḤAFṢ 'UMAR b. MUḤAMMAD 460–487 A.H. = 1068–1094 A.D.
AL-MU'TAḌID BI'LLĀH ABŪ-'AMR 'ABBĀD b. MUḤAMMAD b. 'ABBĀD 433–461 A.H. = 1042–1069 A.D.
AL-MU'TAMID 'ALĀ'LLĀH ABŪ'L-QĀSIM MUḤAMMAD b. 'ABBĀD 461–484 A.H. = 1069–1091 A.D. THE HISPANIC NUMISMATIC SERIES consists of publications devoted to the coinage of the Iberian Peninsula and of related countries, and is based on the Collection of The Hispanic Society of America. It is publishled jointly by The American Numismatc Society and The Hispanic Society of America. The present volume deals with the Islamic coinages of Spain during the fifth century of the Muslim era, the eleventh Christian century. 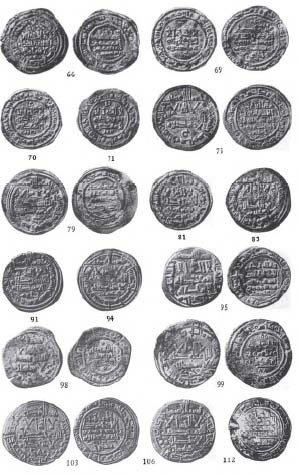 The period commences immediately after the total collapse of the Umayyad Caliphate, that is at the point where the first volume in this series, The Coinage of the Umayyads of Spain ,1 left off, and it terminates roughly with the arrival of the Murābits (the "Almora-vides") from North Africa toward the end of the century. The political confusion of the period, commonly known as that of the Mulūk al-Tawā'if in Arabic, or the Reyes de Taifas in Spanish—the "party kings"—is fully reflected in the complexities of the very diverse and frequently obscure coinage. 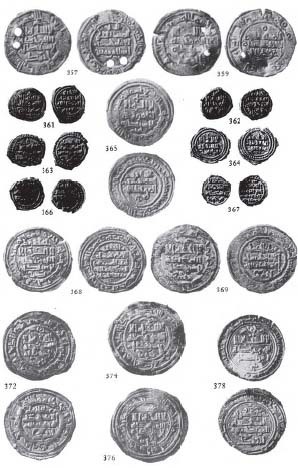 For a time at least the Murābit ascendancy puts an end to the monetary issues of petty kings and princes, and imposes upon most of the Muslim lands of the peninsula a numismatic as well as a political unity. There follows in the mid-sixth (twelfth) century a brief recrudescence of autonomous coinages at a few mints, but these are in turn superseded by the next wave of Berbers, the Muwahhids ("Almohades"). 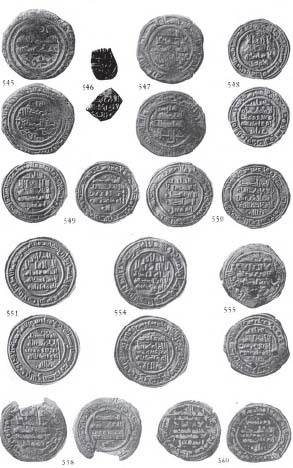 Thus, despite their diversity, the Spanish coinages of the fifth century of the Hijrah present a certain unity—the fall of the Caliphate on the one hand, and the appearance of the Murābits on the other, providing a logical and convenient beginning and end for the division of Hispanic numismatic history represented in these pages. No attempt has been made in this volume to present anything more than a catalogue of the coins of the Mulūk al-Tawā'if in the cabinets of the Hispanic Society of America and of the American Numismatic Society. For several reasons a Corpus, such as those undertaken in The Coinage of the Umayyads of Spain and in The Coinage of the Visigoths of Spain ,2 seemed inappropriate, if not out of the question. 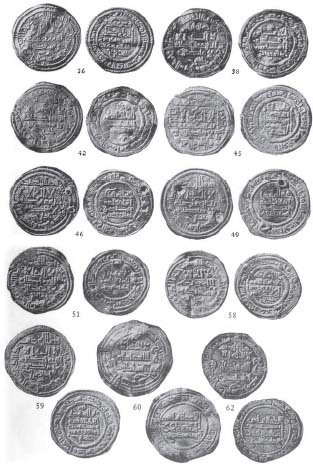 In the first place, Antonio Prieto y Vives' excellent Los Reyes de Taifas: Estudio histórico-numismático de los Musulmanes españoles en el siglo V de la Hégira (XI de J. C.) (Madrid, 1926,)3 although not a Corpus in the strict sense, in that it contains no reference whatever to the location of specimens, or to their number (except for general indications of rarity and commonness), is so authoritative and inclusive of all the published data that a fresh comprehensive treatment of the subject at this time would indeed appear to be superfluous and premature. In fact, given the available material and the present state of our knowledge, it is doubtful that much can be added to Prieto y Vives' exposition. We must rather wait for new finds of well documented provenance in Spain, and for further historical research, before any additional light can be thrown on the multitudinous obscurities of these coinages. Another reason for compiling a simple catalogue rather than attempting a definitive treatment of the present material is that neither the Hispanic Society collection nor that of the American Numismatic Society contains a sufficiently extensive representation of each of the dynasties and kingdoms in question to constitute a solid core upon which to build a Corpus. For the numerous lacunae we would by and large be dependent upon Prieto y Vives, and more specifically upon the catalogues from which he drew his material,1 for as mentioned above the former cites no specific specimens, omits any mention of ornaments or other details, and includes no metrological data. Prieto's sixteen fine plates are excellent documentation, to be sure, but with the exception of those specimens which it has been possible to identify as being now the property of the Hispanic Society of America (about which more below), there is no manner of determining the provenance of these illustrations.2 In short, without first-hand access to the coins in the 19th century Spanish collections or to supplementary unpublished material, the difficulties of composing an adequate and reliable Corpus can easily be appreciated, and the decision to publish this unpretentious catalogue simply as a contribution toward that ultimate end, will, it is hoped, be approved. While neither of the two collections described herein are, as remarked above, truly comprehensive, they are, especially with respect to certain of the series under consideration, not inconsiderable in numbers. When compared to the corresponding published collections of the British Museum (83 specimens, of the Bibliothèque Nationale (156 specimens), and of the Münzkabinett in Berlin (134 specimens), the 593 pieces of the joint cabinets of the Hispanic Society of America and the American Numismatic Society represent a very respectabe addition to the known body of coins of the Mulūk al-Tawā'if. With regard to the origin of the Hispanic Society collection, the same remarks apply here as those made on earlier occasions:1 documentation of provenance is lacking and the only clue to former ownership is in the comparison of the coins themselves with such few published reproductions of coins in former private Spanish collections as exist. In the present series it has been possible once more to establish that a certain proportion of the Hispanic Society coins derive ultimately from Codera's collection. Identities have been proven by taking note of the indication "U" (for "ejemplar único") in Prieto y Vives' book, by then consulting the tables in Antonio Vives' Monedas (pp. 471 ff.) to find that the unique specimen was in the Codera collection, and finally by comparing the illustration in Prieto y Vives' plates with the coin in hand. Such proven instances of identity are: nos. 334:, 336, 339, 342, 353, 361, 368, 455, 459–460, 462. Naturally Prieto y Vives reproduess only a relatively small proportion of the total number of coins described, and hence one frequently cannot clinch the identity of given Hispanic Society specimens with unique Codera specimens by visual comparison, but in many cases there can be hardly any doubt whatever of this identity, as for example nos. 38, 58, 83, 95, 157–159, 264–265, 340–341, 352, 364–365, 454, 456–458, 461, 466, 496, 523, 532, 557, 566. And there is in all probability a still larger number of cases where identity cannot be established because Vives' lists show that Codera's specimen was not unique, and the correspondenee cannot therefore be proven or assumed, but where the likelihood is nevertheesss very strong. 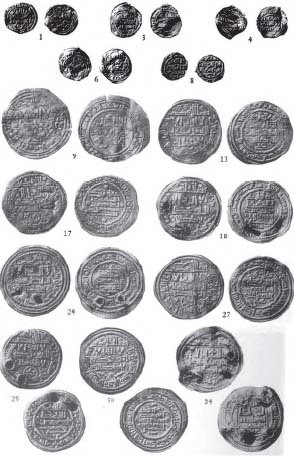 As for the collection of the American Numismatic Society, it will be noted in the catalogue that many of the coins derive from E. T. Newell's collection and that in numerous instances he acquired them from the collection of Alvaro Campaner y Fuertes.2 Another lot from Mr. Newell's collection deserves particular mention: the fractional dinars from a hoard of uncertain provenance, consisting of 152 pieces. 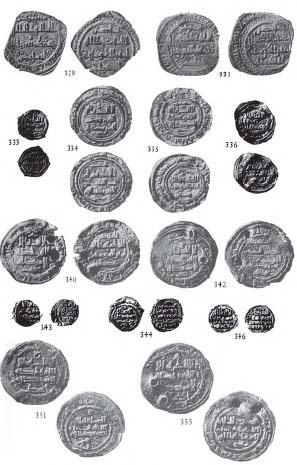 The Fātimid coins in this hoard, 54 in number, have been published.1 Those appearing in the present volume are: unidentified independent rulers of the revolutionary period (8 specimens), 'Āmirids in Valencia (1), 'Āmirids in Almeria (68), Tujibids of Zaragoza (3), Hūdids of Zaragoza (4), Dhū'l-Nūnids of Toledo (10), unidentified (1). 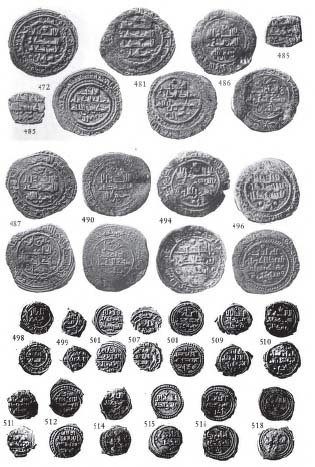 The three remaining pieces in the hoard, fractional dinars of Hishām II, have been published in Umayyads of Spain .2 The hoard is of interest in that it demonstrates the concurrent circulation of Fātimid gold from Sicily with that of various Spanish cities. The earliest preserved date in the hoard is 401 A. H. (1010/11 A. D.), the latest 444 A. H. (1052/53 A. D.). 3 Theoretically the range of the undated specimens, or of those with dates effaced, extends from the beginning of the Umayyad al-Hishām's rule in 366 A. H. (976 A.D.) to the end of the Fātimid al-Mustansir's in 487 A. H. (1094 A. D.), but it will be observed that most of the coins are datable to the first five decades of the 5th (11th) century, and it would appear that the date of the hoard's burial was about 445 or 450 A. H., the locality probably somewhere along the central eastern coast of Spain. Aside from the coins of the Newell collection, the cabinet of the American Numismatic Society contains a considerable number of specimens from the late Howland Wood's collection, many of these purchased at an auction in 1911, which, according to the sales catalogue,4 contained a part of the collection of Sr. Antonio Ma. Pena of Palma, Mallorca. Some of Mr. Newell's specimens probably came from the same source. Finally some of the American Numismatic Society specimens were acquired from W. H. Valentine's collection, and a few others are on indefinite loan from the University Museum, Philadelphia. Several coins belonging to Mr. Jesse Yockers of New York City have been included. Unless transcribed, the reverse marginal legend is always understood to be the usual verse, Qur'ān IX 33: محمد رسول الله ارسله بالهدي و دين الحق ليظهره على الدين كله و لو كره المشركون (frequently incomplete). The beginning of the obverse marginal formula (بسم الله ضرب هذا الدرهم, etc.) is omitted, unless it is in some way irregular or unusual. The mint name is transcribed only at the beginning of a series. Thereafter in each description it is understood to be present. The marginal legend is in circular form unless otherwise indicated.1 The reproductions of the ornaments are of course somewhat conventionalized and are to be taken as approximations only. 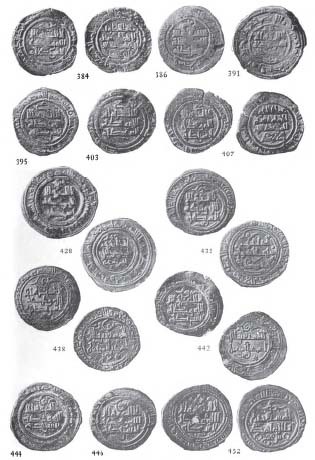 There being a great variety of borders enclosing the marginal and area legends of the coins of the Mulūk al-Tawā'if, it was thought advisable to compile a single illustrated list of these and to refer to each by number rather than to describe them each time they occur. This list will be found on pp. 157–160. References at the end of the description of each coin are to Prieto y Vives (abbrevateed P.). Where supplementary references to Antonio Vives' Monedas are called for, the letter V. is used. The only other abbreviations used are HSA for Hispanic Society of America, and ANS for American Numismatic Society. Where the word "hoard" appears after "Newell", the reference is to the hoard of fractional dinars discussed above. Diameters are in millimeters, weights in grams. Hispanic Numismatic Series, No. 1, New York City, 1950. Although he makes no mention of his sources, the principal ones undoubtedly were Francisco Codera y Zaidín's Tratado de numismática arábigoespañola and Antonio Vives y Escudero's Monedas de las dinastías arábigoespañolas (cf. Umayyads of Spain , pp. 3–4, 12–13, for comments on these works), and the British Museum, Paris and Berlin catalogues. Umayyads of Spain , p. viii and footnote 1 on that page; Visigoths of Spain , pp. xi–xii. See George C. Miles, Fātimid Coins in the Collections of the University Museum, Philadelphia, and the American Numismatic Society (Numismatic Notes and Monographs, No. 121, New York City, 1951), p. 3. The total of Fātimid coins in the hoard is there mistakenly given as 48 instead of 54. Cf. Umayyads of Spain , pp. 97–100. Hispanic Numismatic Series, No. 2, New York City, 1952. Professor Emilio García Gómez tells me in a private communication that Prieto y Vives had a large collection of plaster-casts, from which undoubtedly his illustrations were reproduced. These are now in the Instituto de Valencia de Don Juan. So I assume from the simple name "Campaner" followed by a price indication on the back of Mr. Newell's labels. Nos. 351 (b), 352 (c) and (d). Cf. 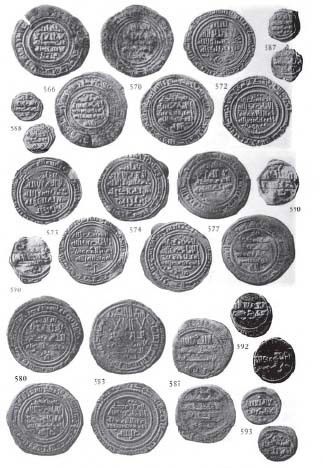 my comments in Umayyads of Spain , p. 10; and R. Vasmer's extensive review in Zeitschrift für Numismatik, 1928, pp. 223–234. Fātimid Coins, nos. 125 and 285. 158th Sale by Lyman H. Low , N. Y., March 27, 1911. The designation of the metal used for the dirhems of most of the Mulūk al-Tawā'if presents a problem. Debasement is the rule rather than the exception. It has not been possible to carry out any chemical or physical tests, but in appearance the dirhems range all the way from nearly pure silver to bronze or copper. While the great majority would commonly be called billon, it has very frequently proven difficult to decide whether to describe a given piece as "silver" or "billon" or to distinguish between "billon" and "copper". The following designations have therefore been employed: for metal of evidently high silver content, 1 and 2 for billon of respectively declining silver content, Æ for metal which shows no traces of silver, all these descriptions being based on appearance only and subject doubtless to broad revision if a scientfiic method of analysis were employed. In any case, all these dirhems were undoubtedly intended to be of silver, even those which have been described as Æ.
Ca. 422–428 A.H. = 1030–1037 A.D. Borders: obv. & rev. 16. 3. As nos. 1–2, but margin ends: بالاندلس, and borders: obv. 38, rev. 16. 4. As no. 3, but borders: obv. & rev. 38. 5. As no. 3, but borders: obv. 38, rev. 33. Borders: Obv. 16, rev. 33. ابن تمام, according to Vives (nos. 808—814). I agree with Prieto that the first letter looks more like حـ or the like. The ا of حمام is sometimes lacking. Apparently not ابن as alleged to be on previously published specimens. 8. As no. 7, but traces of margins only, and borders: obv. & rev. 21. Three dirhems in the Hispanic Society collection struck during the revolutionary period by unknown persons did not come to the attention of the writer until after this catalogue was compiled. These are: two fragmentary specimens of al-Andalus, 404 A. H., similar to P. 32a, and one of al-Andalus, 405 A.H., similar to P. 28d. The latter measures 22 mm. and weighs 2.04 grms. 404 A.H. = 1013/14 A.D. Borders: obv. 3, rev. 7. 405 (?) A.H. = 1014/15 (?) A.D. Borders: obv. 6, rev. 7. Cf. P., pp. 24–32, 109–116. Governor of Ceuta in 400, "Caliph" in 407. 406 A.H. = 1015/16 A.D.
Ca. 405–407 A.H. = 1014–1017 A.D.
407 A.H. = 1016/17 A.D. Borders: obv. 6, rev. 16. Borders: obv. 6, rev. 51. HSA 14144 23, 3. 31, twice pierced, same obv. die as no. 16. Rev. marg. interrupted by at least twice. Rev. legend as no. 17, no ornaments. Borders: obv. 6, rev. 17. 21. Mint effaced, probably Sabtah. Borders: obv. 3a, rev. 7. 408 A.H. = 1017/18 A.D. Marg. : ثمان ربع مائة (1st quarter rectilinear). The ه of الله ends in palmette. Borders: obv. 6, rev. 61. Borders: obv. 3, rev. 4. Marg. : الدرهم بمدبنة سبتة سنة ثمان وار (1st quarter rectilinear). The ه of الله ends in palmette. Rev. legend as no. 17, ornament consists of + projecting into area from inner border at 3, 6, 9 (and probably) 12 o'clock. Borders: obv. 59, rev. 4. Borders: obv. 52, rev. 7. 407 or 408 A.H. = 1016/18 A.D. Borders: obv. 6a, rev. 40. Borders: obv. 6a, rev. 7. 408–414 A.H. = 1018–1023 A.D.
Dirhems Madīnat Sabtah 408 A.H. = 1018 A.D. Borders: obv. 62, rev. 7. P. 71a = V. 735 (Codera) = this coin (?). 409 A.H. = 1018/19 A.D.
39. Obv. legend as no. 38. Rev. legend as no. 38, no ornament. 40. Obv. legend as no. 38. 41. Obv. legend as no. 38. 42.–43. Obv. legend as no. 38. Several letters terminate in palmettes. 48. Obv. legend as no. 46. Prieto lists this as unique, but there are several specimens tabulated in Vives. 410 A.H. = 1019/20 A.D.
49. Date partially effaced, probably 410. Obv. legend as no. 46. Rev. legend as no. 46. 50. Date effaced, probably 410. The words امير المؤمنين abbreviated. Prieto lists this as unique, but there were two specimens in the Vives collection. 411 A.H. = 1020/21 A.D.
55. Obv. legend as no. 51. Rev. legend as no. 52. Borders: obv. 15, rev. 16. Obv. legend as no. 51. Rev. legend as no. 52, but at right. p. 79 = V. 748 (Codera) = this coin (?). 412 A.H. = 1021/22 A.D. Marg. : عشر و اربع مـ Three letters end in elaborate palmettes. Marg. : عشر و اربع ماه Palmettes as on no. 60. Marg. : عشر و اربع مائة Five letters end in elaborate palmettes. Marg. : عشر و اربعمائة Palmettes as on no. 60. Borders: obv. 6a, rev. 16. Rev. legend as no. 60. Marg. : عشر و اربع ما Palmettes as on no. 62. Marg. : عشر و اربع مائـ Palmettes as on no. 60, but cramped style. Borders: obv. 53, rev. 7. 68. Date uncertain. 410 A.H.? Rev. legend as no. 59. Borders: obv. 3a, rev. 7a. 412–427 A.H. = 1021–1035 A.D.
418 A.H. = 1027/28 A.D. Borders: obv. and rev. 16. Cf. P. 83f, which, however has حـ beneath the obverse. 421 A.H. = 1030 A.D.
Rev. legend as no. 69, no ornament. Marg. : و اربع مـ (sic) احدا عشرا The type requires the date 421, not 411 as written. Also it will be noted that the yā of عشرين on the specimen of 426 has the appearance of an alif. Borders: obv. and rev. 7. 426 A.H. = 1034/35 A.D.
414 A.H. = 1023/24 A.D.
415 A.H. = 1024/25 A.D.
Rev. legend as no. 72. 416 A.H. = 1025/26 A.D. Borders: obv. 6, rev. 7, with some vertical letters extending into inner border. 417 A.H. = 1026/27 A.D.
Rev. legend as no. 72, but • at left of 1st and 3rd lines. 419 A.H. = 1028 A.D.
420 A.H. = 1029 A.D.
Vives, probably by error, does not list Codera as the owner of this coin. Borders: obv. 6, rev. 9. Borders: obv. 6, rev. 4. 422 A.H. = 1030/31 A.D.
423 A.H. = 1031/32 A.D.
425 A.H. = 1033/34 A.D. Borders: obv. 42, rev. 7. 422 A.H. = 1050/51 A.D.
HSA 15725 1 22, 2.04. 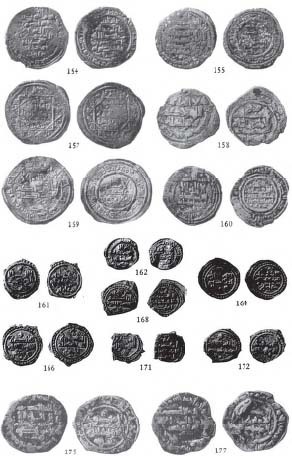 Although officially his first reign ended in 438, the coins demonstrate that he continued to exercise authority in certain areas from 439 until 446. 437 A.H. = 1045/46 A.D. Borders: obv. 15, rev. 7. 97. Mint? As no. 96, but name beneath obv. obscure, and mint? 438 A.H. = 1046/47 A.D.
Prieto throughout erroneously transcribes العلى بالله. 438–446 A.H. = 1047–1055 A.D.
439 A.H. = 1047/48 A.D.
Rev. legend as no. 99, no ornaments. 440 A.H. = 1048/49 A.D. Borders: obv. 16, rev. 56. Borders: obv. 42a, rev. 7. Borders: obv. 6a, rev. 4. 441 A.H. = 1049/50 A.D.
Rev. legend as no. 102. 442 A.H. = 1050/51 A.D.
443 A.H. = 1051/52 A.D.
125. As no. 122, but borders: obv. 3a, rev. 7. Marg. : ثلث و اربعيـ (1st quarter rectilinear) Borders: obv. 3a, rev. 7. 444 A.H. = 1052/53 A.D. Borders: obv. 15, rev. 46. Ca. 440–446 A.H. = 1048–1055 A.D.
444–447 A.H. = 1052–1055 A.D.
445 A.H. = 1053/54 A.D.
Ca. 445 A.H. = 1053/54 A.D.
440–446 A.H. = 1048–1055 A.D.
Ca. 443–446 A.H. = 1051–1055 A.D. Marg. : date and mint effaced. Ca. 430–466 A.H. = 1038–1074 A.D.
139. As no. 138, but marg. ends: سنة. Borders: obv. 42, rev. 54. Borders: obv. 3, rev. 9. Rev. legend as no. 138, ornament above area, if any, effaced. Rev. legend as no. 138, no ornament. Cf. P., pp. 28–32, 113–114. The roughly oblong shape of this specimen resembles that of the heavier specimens, below. Cf. Encyclopedia of Islām, s. v. Bādīs. Coins of circular, or nearly circular, crude but conventional appearance, and more or less normal weight. What appears to be a crescent-likee ornament on both obv. and rev. of many of these coins is simply a punch for ر or ن widely separated from the rest of the legend. Borders: obv. 42, rev. 54 (probably outer circle off flan). Rev. legend as no. 138, ornament: ? Borders: obv. off flan, rev. 7. Crude coins, mostly roughly rectangular in shape, heavy in weight. 453–471 A.H. = 1061–1078 A.D.
464 (?) A.H. = 1071/72 (?) A.D. Borders: obv. 52, rev. 55. P. 126a; Hazard 883 = this coin. 46X A.H. = 1068–1077 A.D.
Cf. P., pp. 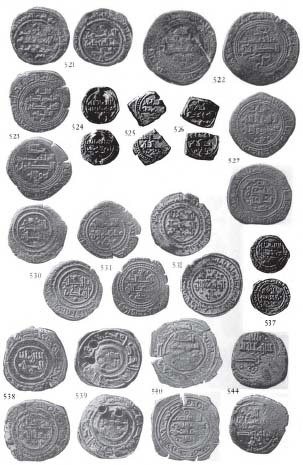 27, 31, 117; Harry W. Hazard, The Numismatic History of Late Medieval North Africa (ANS Numismatic Studies, No. 8), N. Y., 1952, pp. 67–59, 235–236, 281–282. 156. As no. 154, but points: الامام • and • العز date effaced. 157. Areas enclosed by eight-pointed star formed by obliquely superimposed squares. Margin of both obv. and rev. : Qur'an IX 33 to ليظهر running along outer edge of star, using it as base-line. Borders: obv. 3, rev. 3. P. 127 = V. 881 (Codera) = this coin (almost certainly) = Hazard 887. Vives, and following him Prieto and Hazard, read ضياو الدولة in the fourth line of the obverse. This is a barely possible reading, but the form is scarcely likely, and I think سيف is more probable. Vives and Hazard read ضياو in the first line of the reverse; Prieto left the space blank. I believe ضيا can be read. Hazard (pp. 58–59), following a line of reasoning based on the difference of epithets on nos. 154–156 and no. 157, attributes this unusual coin to Saqawt b. al-'Izz b. Saqawt. But there are frequent numismatic instances of Moslem rulers using a variety of epithets; and I do not grasp Hazard's further argument (p. 59) that "no explanation has been offered.....for his appearance as chancellor following his undoubted death." The coin is undated. Hazard failed to observe that the descriptions by Vives and Prieto relate to the identical specimen; and that the HSA piece is this specimen. P. 1323 = V. 804 (Codera and Vives) = (probably) this coin. The "Beniatia" and "Zenetas de Fez" of Prieto, pp. 31, 117. Cf. Miles, Umayyads of Spain , pp. 80–81; Encyclopaedia of Islām, s. v. Zenāta. 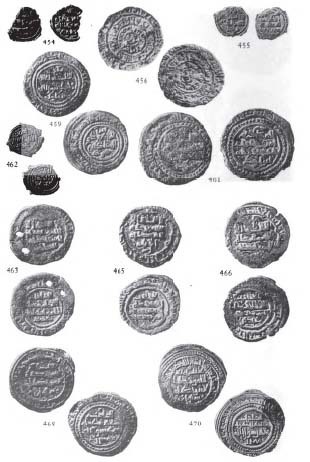 On the coin described below al-Mu'izz acknowledges the sovereignty of the Hammūdid Caliph, al-Qāsim I.
Prieto lists this issue as unique, but Vives had already inventoried two specimens. Borders: obv. 15a, rev. 7. P. 137 = V. 820 (Codera) = this coin (?). Cf. P., pp. 35, 105, 119. For the mint-name and mention of the coin here described, see Umayyads of Spain , pp. 53–54. Also cf. no. 357, infra. It appears as though a line had been gouged out of the die. For my doubts about the reading of the mint-name, see Umayyads of Spain , p. 54. 406 (?) A.H. = 1015/16 (?) A.D. Borders: obv. 3a, rev. 17. Cf. P. 140 (no date)2 = V. 1039 (Codera and Vives). Cf. P., pp. 29, 34, 40, 64, 119. Prieto lists this as unique, but Vives gives two specimens. The coin illustrated by Prieto is not the HSA specimen. 412–453 A.H. = 1021–1061 A.D. Borders: obv. and rev. 27. 428 A.H. = 1036/37 A.D.
Rev. marg. : Qur'ān IX 33. Borders: obv. 15, rev. 28. Cf. P., pp. 34, 38–41, 62, 120–121. Borders: obv. and rev. 30. 170. Similar to no. 168, but beneath obv. 436 (?) A.H. = 1044/45 (?) A.D. Borders: obv. 16, rev. 7. 447 A.H. = 1045/56 A.D.
448 A.H. = 1046/57 A.D. Borders: obv. 28, rev. 62. 453–457 A.H. = 1061–1065 A.D.
455 A.H. = 1063 A.D.
456 A.H. = 1063/64 A.D.
185. الظافر in last line has floral termination. Rev. legend as no. 184. 45X A.H. (ca. 456–457) = ca. 1063–1065 A.D.
187. Obv. as no. 186. Rev. legend, as no. 184. Ruling in Almeria, ca. 429–435 A.H. = 1037–1044 A.D.
Rev. marg. : traces of Qur'ān IX 33. Borders: obv. and rev. 22. 189. As no. 188, but few traces in margin illegible. Marg. : occasional traces on obverse, probably meaningless. Borders: obv. 22, rev. 13. Cf. 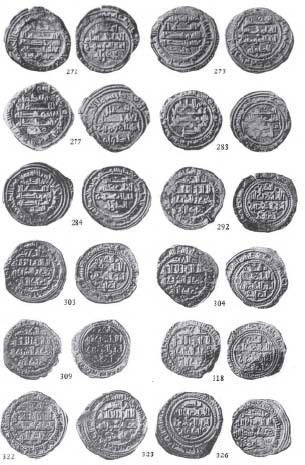 P. 176a, described as having الناصر beneath the rev., but the illustration does not show this, and the dies appear to be identical with the above. 202.–248. Similar to nos. 192–201, but obv. from a different die, the names above and beneath mutilated and appearing to read الرحمن or the like, and بن حميم (the first mīm below the line of the other letters); but probably the same name is intended as on. nos. 192–201. Margs. : occasional traces, probably meaningless. Borders: obv. 17 (outer border usually off flan, final letters of 2nd and 3rd lines of area appear as annulets between inner borders), rev. 17. 249. Identical with nos. 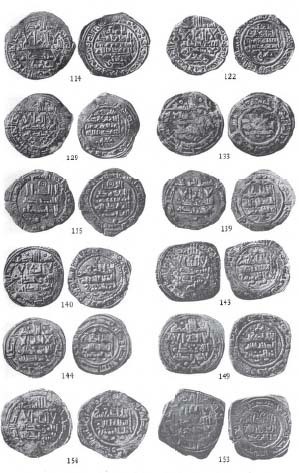 202–248, same dies, but not in hoard. Margs. : rare traces, probably meaningless. Cf. P., pp. 39–40, 61, 121; Encyclopaedia of Islām, s. v. Almeria; R. Dozy, Recherches sur l'histoire et la littérature de l'Espagne pendant le moyen âge (3rd ed. ), I, pp. 239ff. This word is very obscure, but it resembles that on the silver (no. 260, below), which is quite probably الناصر. The inscriptions on all these fractional dinars, as well as on the silver, ara barbarous or semi-barbarous and virtually illegible. Garbled, second ا on side? Margs. : illegible traces, probably meaningless. A. H. (P. 170b, c). 258. Similar to no. 257, but cruder and legends only partially preserved. Margs. : obliterated or off flan. Borders: obv. 22?, rev. 24. Cf. P. 175, with ابن عبد الرحيم on one line beneath obv., and المنصور and الناصر above and beneath rev. 261. Probably similar to no. 260, with (⸮) ابن عبد above obv. area, name beneath mostly effaced; rev., المنصور clear above, (⸮) الناصر beneath. Mr. Jesse Yockers has a similar specimen in his collection, but there is no trace of a marginal legend, the border arrangement being 13. Ca. 427–445 A.H. = 1035–1054 A.D. Borders: obv. 6, rev. 31. 263. As no. 262, but obv. and rev. Cf. P., pp. 38–39, 121–122. P. 194 (probably) = V. 1392 (Codera, 2)1 = these specimens (?). Vives attributed these unusual pieces to Mu'izz al-Dawlah of Lérida or Tortosa, ca. 445–450 A.H2. But the name of Yac'lā is not present, and it would seem more likely to me that they belong to Muqātil (? ), although actually there is no clear evidence that they are issues of Tortosa at all. AL-MUWAFFAQ BI'LIĀH ABŪ'L-JAYSH MUJĀHID b.
Ca. 405–436 A.H. = 1014–1045 A.D.
435 A.H. = 1043/44 A.D. Borders: obv. 3, rev. 22. Cf. P., pp. 34–37, 122–123; Encyclopaedia of Islām, s. v. Mudjāhid. 436–468 A.H. = 1044–1076 A.D. Borders: obv. 45, rev. 57. 271. As no. 268, but date effaced. 272. على/عبد الملك Rev. as no. 268. Borders: obv. 45, rev. 7. Borders: obv. 42, rev. 69. Borders: obv. 2, rev. 7. Borders: obv. 2, rev. 5. 449 A.H. = 1057/58 A.D.
450 A.H. = 1058/59 A.D.
280.–282. As no. 273, dates effaced. 467 A.H. = 1074/75 A.D. Borders: obv. 7, rev. 4. 468 A.H. = 1075/76 A.D.
468–486 A.H. = 1076–1093 A.D.
480 A.H. = 1087/88 A.D. Borders: obv. 3 or 6, rev. 31 or 35. Occasional annulets above marginal legend and in borders. 294. As no. 293, but last digit partly obliterated by piercings. Cf. P., pp. 35–37, 123. 481 A.H. = 1088/89 A.D.
301. Obv. as no. 298, but: عبد الله and marginal legend begins at 9 o'clock. 302. As no. 298, but partially obliterated by piercings, and marginal legend begins at 11 o'clock. 482 A.H. = 1089/90 A.D.
483 A.H. = 1090/91 A.D.
310. As preceding, but end of date obliterated. 484 A.H. = 1091/92 A.D.
485 A.H. = 1092/93 A.D.
486 A.H. = 1093 A.D.
486–508 A.H. = 1093–1115 A.D.
487 A.H. = 1094/95 A.D.
488 A.H. = 1095 A.D.
494 A.H. = 1100/01 A.D. The flans of these specimens frequently are not large enough to accomodate the complete die, and hence the outer linear borders are often lacking. 499 A.H. = 1105/06 A.D.
501 A.H. = 1107/08 A.D.
505 A.H. = 1111/12 A.D.
506 A.H. = 1112/13 A.D.
ANS (Wood) Æ 25 (nearly square), frg. Mr. Jesse Yockers has a specimen similar to no. 328, but with date and rev. similar to no. 324. 507 A.H. = 1113/14 A.D.
332. As nos. 323–331, but date and mint effaced and ornaments obscure. 414–420 A.H. = 1023–1029 A.D. Borders: obv. and rev. 23. Similar to P. 223, date lacking. Cf. P., pp. 43–45, 125–126. 420–430 A.H. = 1029–1039 A.D. Borders: obv. and rev. 18. Borders: obv. and rev. 20. Prieto y Vives mistakenly has مدينة سرقسطة in the transcription. The word مدينة is certainly lacking in this specimen, which he illustrates. Vives listed two other specimens; perhaps the word was present in one or both of them. P. 230 = V. 1141 (Codera) = this coin. Rev. area similar to no. 335. Borders: obv. and rev. 21. 430 A.H. = 1038/39 A.D.
P. 231 = V. 1142 (Codera2 and Vives) = this coin. Prieto y Vives and Vives transcribed محمد (? ), but it seems to me clear that the letters on this specimen as well as on the two others below are clearly محب. The final letter cannot possibly be dāl. Three specimens in the Codera collection according to Vives. The two others are probably nos. 340 and 341, below. 430–431 A.H. = 1039 A.D.
430 A.H. = 1039 A.D. Borders: obv. 3, rev. 11. P. 232 = V. 1143 (Codera) = this coin. See Dozy, Recheches, I (3rd ed. ), pp. 235–239. 431–438 A.H. = 1039–1047 A.D. Marg. : Qur'ān IX 33, traces. Borders: obv. and rev. 35. Similar to P. 235 (dated 431). Cf. P., pp. 46–50, 126–131: Dozy, Recherches, I (3rd ed. ), pp. 231ff. 345. Similar to no. 344, but traces only of margins, and borders apparently obv. and rev. 23. Borders: obv. 21, rev. 26. Borders: obv. 13, rev. 30. 436 A.H. = 1044/45 A.D. Borders: obv. 6a, rev. 7a. HSA 15805 Ꜹ1 24, 3.42. 431 A.H. = 1039/40 A.D. Borders: obv. 53, rev. obscure. P. 233 = V. 1144 = probably this coin. Borders: obv. 6a, rev. 11. P. 234a = V. 1145 (Codera) = this coin. Borders: obv. obscure, rev. 7. Rev. as no. 352, but: و of المؤيد has floral ending. Borders: obv. 6, rev. 7? HSA 15803 1 24, 3.37, twice pierced. Borders: obv. 15a, rev. 16. Borders: obv. 6. rev. 7. Cf. no. 159, above, and the notes there. Ca. 438–441 A.H. = 1046–1050 A.D.
P. 250 = V. 1160 (Codera and others) = this coin. Cf. P., pp. 46, 127. Attributed to Zaragoza on the basis of style. P. 259 = V. 1166 = this coin (?). 441–4751 A.H. = 1049–1083 A.D.
Margins: obv. none on flan, rev. traces (?). Borders: obv. 14, rev. 21. Cf. 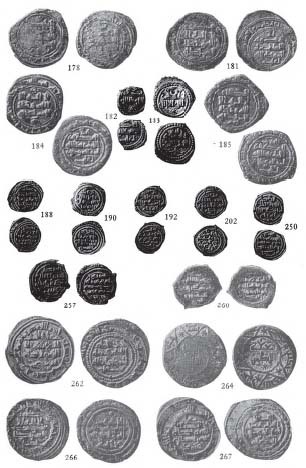 P., p. 128, for the anomay of Yūsuf's (Ahmad's successor) coins struck in 474. P. 262 = V. 1170 (Codera) = this coin. Rev. legend as no. 369. Borders: obv. and rev. 7 (with annulets between outer circles). Borders: obv. 7, rev. as no. 372. As no. 374, but Æ, ornament above obv. obscure, date و اربعـ(⸮)خمس, and outer borders obscure. HSA 15898 Æ 27, 3.43, punched but not pierced. 446 A.H. = 1054/55 A.D.
447 A.H. = 1055/56 A.D.
Rev. as no. 369, but ◦ above, and • at end of 2nd line and in center. Borders: obv. 18, rev. 11. Rev. as no. 369, but • at end of 2nd at 3rd lines. Borders: obv. 7, rev. 7 with annulets. Rev. legend as no. 379. 448 A.H. = 1056/57 A.D. Borders: obv. 7 or 16, rev. 7. Borders: obv. 7 with annulets, rev. 16. 464 A.H. = 1071/72 A.D.
465 A.H. = 1072/73 A.D.
466 A.H. = 1073/74 A.D.
Part or all of the outer circle frequently off the flan on the succeeding specimens below. 469 A.H. = 1076/77 A.D.
470 A. H. = 1077/78 A. D.
471 A.H. = 1078/79 A.D.
472 A.H. = 1079/80 A.D.
473 A. H. = 1080/81 A.D.
475 A.H. = 1082/83 A.D. Date Effaced, ca. 470–475 A.H. = 1077–1083 A.D. Borders: obv. and rev. 7a. Date Effaced, ca. 460–475 A.H. = 1067–1083 A.D.
416.–425. Similar to no. 395, but dates effaced, some with various points in obv. and rev. areas. Date Effaced, ca. 441–475 A.H. = 1049–1083 A.D.
426.–427. Similar to nos. 369 and following, but dates effaced and ornament or letter obscure. 474 A.H. = 1081/82 A.D.
428. ر of لا شريك floral. Borders: obv. 7, rev. 9. 476–503 A.H. = 1083–1110 A.D.
476 A.H. = 1083/84 A.D.
430. ر of لا شريك floral. Borders: obv. and rev. 9. 431. As no. 430, but poorly preserved, ornaments obscure. 477 A.H. = 1084/85 A.D.
479 A.H. = 1086/87 A.D.
Digit effaced, 476–479 A.H. = 1083–1097 A.D.
436. As nos. 430 and following, but obv. : , rev. as no. 432. Borders: obv. 9, rev. 16. Borders: obv. 7, rev. 16. 487 A.H. = 1094 A.D. Borders: obv. and rev. 7? 489 A.H. = 1095/96 A.D.
Digits Effaced, 48X A.H. = 1088–1096 A.D.
447.–451. Five specimens similar to nos. 438–446, dates imperfectly preserved. 497 A.H. = 1103/04 A.D. Borders: obv. 35, with 4 annulets between inner circles, rev. 32. 453. Similar to no. 452, but obv. margin completely off flan. Ca. 438–459 A.H. = 1046–1067 A.D.
P. 278 = V. 1239 (Codera) = this coin? Cf. P., pp. 46–48, 127, 129–130. Prieto y Vives illustrates this piece. The shape differs slightly from that of the HSA specimen, but this is probably the result of improper trimming of the plaster-catt from which the illustration was made. 3. Outer: rest of Qur'ān IX 33. Borders: single linear circles enclosing each legend. P. 281a = V. 1244 (Codera) = this coin? P. 277 = V. 1243 (Codera) = this coin? V. 1237 (Codera) = this coin? Vives (and Prieto y Vives, following him) transcribed: ......... معز الدولة، but I am unable to read this. Only one of the three known issues of this unusual Fāṭimid-style type is illustrated in P. (no. 281c, dated 459 A.H.), but the inner marginal legend is quite illegible. If the name is Mu'izz al-Dawlah, can this be the King of Tortosa? Obv. marg. : ضرب دهم five times repeated. Rev. marg. : ضرب درهم five times repeated. Borders: obv. 50, rev. 67. P. 283 = V. 1241 (Codera, 2 spec.) = this coin, and no. 460, below. 460. Similar to no. 459, but areas less well preserved, obv. margin perhaps sometimes درهم, and both obv. and rev. borders 67. Borders: obv. 29, rev. 36. P. 284 = V. 1242 (Codera) = this coin? Ca. 439–440 A.H. = 1047–1049 A.D.
Cf. P., pp. 46, 127, 130. The plaster-cast from which the illustration in P. was made was inaccurately trimmed. Ca. 439–442 A.H. = 1047–1051 A.D.
P. 295b = V. 1259 (Codera) = this coin? Cf. P., pp. 46, 130. Borders: obv. 6?, rev. 7. 474–483 A.H. = 1081–1090 A.D. The last line in Naskhi script. Rev. marg. begins with ارسله at 9 o'clock. Borders: obv. 53, rev. 62. Rev. as no. 468, but no star above. Rev. marg. begins with ارسله at 8:30 o'clock. Borders: obv. 63, rev. 62. Rev. marg. as no. 469. Borders: obv. 63, rev. 66. Borders: obv. 53, rev. 66. Cf. P., pp. 47–49, 130. The various points and circles in the obverse areas of the succeeding specimens, varying in position and number and usually more numerous than on this particular specimen, are not noted hereafter. Frequently there are points before and after each line of the area. Rev. marg. as no. 468. 473. As preceding, but points vary. Borders: obv. 47, rev. 54. 474. Obv. as preceding, but points vary. Rev. marg. begins with ارسله at 8 o'clock. 478. Obv. as preceding, but points vary and ornament above uncertain. 478 A.H. = 1085/86 A.D. Borders: obv. 53, rev. 50. Rev. marg. begins with بالهدي (sic) ارسله اللله (at 9 o'clock. ANS (Wood) 2 26, 4.67. 485. Similar to nos. 468–484, but clipped, marginal legends and borders lacking. In Denia: 483–485 A.H. = 1090–1092 A.D. In Tortosa: 483–ca. 492 A.H. = 1090–ca. 1099 A.D. Various points and circles in margin. Borders: obv. 71, rev. 16. Borders: obv. 71, rev. 4. Cf. P., pp. 49, 131. 485 A.H. = 1092 A.D. Borders: obv. and rev. 4. Rev. as no. 487, but points vary. Borders: obv. 16, rev. 4. As preceding, but date and ornamenss obscure. Borders: obv. 41, rev. 62. Borders: obv. 42, rev. 72. 48X A.H. = 1090–1096 A.D. Borders: obv. 21, rev. 7. 492 A.H. = 1098/99 A.D. Borders: obv. 21, rev. 70. P. 304c1 = (?) V. 1351 (Codera) = this coin? Lacking بسم الله،, he says. Al-ẒĀFIR DHŪ'L-RI'ĀSATAYN ABŪ-MUḤAMMAD ISMĀ'ĪL b.
Cf. P., pp. 53, 133–134; Dozy, Recherches, I, P. 238. The usual date for Ismā'īl's accession is 427, but there is an inscription relating to the construction of a cistern in the mosque of Toledo, bearing his full titles and dated 423, which would seem to indicate that he was already ruling in Toledo at that date. See E. Lévi-Provençal, Inscriptions arabes d'Espagne, pp. 65–66; and cf. D. W. Dunlop, "The Dhunnunids of Toledo," in JRAS, 1942, P. 83. Partially off flan on several specimens. 43X A.H. = 1039–1044 A.D. Borders: as no. 508 (rev. off flan). 512. Obv. as no. 511. 513. Obv. as no. 511, but ر of شرف points upward. Cf. P. 329 (Ṭulayṭalah, 435 A.H.). Rev. as no. 518 (partly off flan). Cf. P., pp. 41, 53–54, 75, 134–135. On any of this series. There appears to be general agreement that al-Ma'mūn Yahyā died in 467, despite the existence of a dirhem of 468 (see no. 523, below). Prieto y Vives admits that the decade is missing on this unique piece and that one might be inclined therefore to assign it to 458; but, as he rightly points out, the remarkable arrangement of the legends is characteristic of the issues of the years 465–467, and there are no known coins of the 450's at all from Toledo. Al-Ma'mūn died late in the year, according to the historians, and it would appear that the die-engraver did not change the principal legends of the 467 issue early in 468. 459 A.H. = 1066/67 A.D. Borders: obv. and rev. 55. 521. As no. 620, but date: تسع و خمسين (mint effaced). Obv. marg. : Qur'ān IX 33. Borders: obv. 64, rev. 57. Borders: obv. and rev. 39. P. 338d = V. 1114 (Codera) = this coin? See the note, P. 124, above. While the mint-name on this unique specimen is admittedly obscure and uncertain, there can be no doubt about the date and the name in the reverse area. Even if the mint is not Balansīyah, the puzzle of the identity of al-Imām al-Ma'mūn remains. Also, if the name is that of al-Ma'mūn Yahyā, what of the posthumous date? And why al-Imām"? Let us hope that a better preserved specimen, or related coins, will eventually turn up to help explain this anomaly. Rev. as no. 525, but ornament above area effaced. Borders: obv. 17, rev. 19. Borders: obv. 9, rev. 10. 529. As no. 527, but عام in place of سنة. The latter date is that of Alfonso's definitive occupation of Toledo. Al-Qādir removed to Valencia and was assassinated in 485. Borders: obv. 19, rev. 10. Borders: obv. 31, rev. 37. Prieto y Vives designates this issue as unique, but Vives (1128) lists two, and probably three, specimens. Borders: obv. 58, rev. 68. P. 345 = V. 1130 (Codera) = this coin? Borders: obv. 31, rev. 34. Borders: obv. 7, rev. 67. ABŪ'L-WALĪD MUḤAMMAD b. JAHWAR b. MUḤAMMAD b.
Cf. P., pp. 64, 136; C. F. Seybold, s. v. Cordoba, in the Encyclopaedia of Islām. Ca. 435–443 A.H. = 1041–1052 A.D.
Obv. marg. : part of Qur'ān IX 33. Borders: obv. and rev. 19. Cf. P., pp. 61–62, 136; E. Lévi-Provencal, s. v. Ma'n and al-Mu'tasim, in the Encyclopaedia of Islām, and C. F. Seybold, ibid., s. v. Almeria; Dozy, Recherches, I, pp. 239–281. 443–484 A.H. = 1052–1091 A.D.
541. Similar to no. 540. Different fabric and size. Marginal legend ends سنة. Outer borders effaced or off flan. 542. Similar to no. 541, but marginal legends only partly preserved. Borders: obv. and rev. 49. Cf. P. 360 (Almarīyah, dated xxi). Cf. P., pp. 66–68, 137; M. Seligsohn, s. v. Afṭasids, in the Encyclopaedia of Islām. I have adopted Prieto y Vives' dates, which differ markedly from those in the primary and the usual secondary written sources. AL-MUTAWAKKIL 'ALA'LLĀH ABŪ-ḤAFṢ 'UMAR b. 460–487 A.H. = 1068–1094 A.D. Borders: obv. 30, rev. off flan. 460 A.H. = 1067/68 A.D. Borders: obv. and rev. 60. 433–461 A.H. = 1042–1069 A.D.
Cf. P., pp. 139–141; E. Lévi-Provençal, s. v. al-Mu'tadid and al-Mutamid. in the Encyclopaedia of Islām. 457 A.H. = 1064/65 A.D. Borders: obv. 55a, rev. 55. 552. Obv. as no. 551. 458 A.H. = 1065/66 A.D. Borders: obv. 1, rev. 7. P. 396 = V. 890 (Codera) = this coin? 559. As no. 558, but nothing above rev. Another specimen in the author's collection, with date ending و ثلثين, and second border from outside markedly thick. 24, 2.73. Borders: obv. 59, rev. 48. Borders: obv. 65, rev. 60. Borders: obv. 6 (? ), rev. 9. Prieto y Vives designates this unique, but Vives (899) lists four specimens. 44X A.H. = ca. 1048–1057 A.D. Date Effaced, ca. 439–448 A.H. = 1047–1057 A.D.
564. Obv. similar to nos. 558–562, but marg. obliterated (circular legend). Borders: obv. and rev. 73. 452 A.H. = 1060 A.D. Borders: obv. obscure, rev. 8. Borders: obv. and rev. 10. P. 3981 = Vives 919 (Codera) = this coin? Date Effaced, ca. 450–457 A.H. = 1058–1065 A.D. Borders: obv. 12, rev. 64. AL-MU'TAMID 'ALĀ'LLĀH ABŪ'L-QĀSIM MUḤAMMAD b. 461–484 A.H. = 1069–1091 A.D. Borders: obv. and rev. 61. 463 A.H. = 1070/71 A.D.
462 A.H. = 1069/70 A.D. Borders: obv. 3, rev. 61. Obv. as no. 575, but both area and margin very obscure. Rev. as no. 575, but: ◦ ∴/ornament? Digit Effaced, ca. 465–466 A.H. = ca. 1072–1074 A.D.
Cf. P. 407 a, b. 579. Obv. as no. 578, ornament beneath, obscure. 470 A.H. = 1077/78 A.D. Borders: obv. and rev. 51. Rev. as no. 580, but •• above. Borders: obv. 6, rev. 58. Date Effaced, ca. 470–478 A.H. = ca. 1077–1086 A.D. Borders: obv. 17, rev. 9. Date Effaced, ca. 483 A.H. = 1090/91 A.D.
Obv. marg. : part of Qur'ān IX 33, probably beginning at 9 o'clock. Cf. P. 428, dated 483. Borders: obv. 22, rev. 16. Obv. marg. : none on flan. Borders: obv. 13, rev. 21. Rev. marg. : off flan, if any. Borders: obv. and rev. 13. 1 Vertical letters extend through borders. 3a As 3, but vertical letters extend through borders. 6a As 6, but vertical letters extend through borders. 7a As 7, but vertical letters extend through borders. 15a As 15, but vertical letters extend through borders. 42a As 42, but vertical letters extend through borders. 53 Vertical letters extend through borders. 55a As 55, but vertical letters extend though borders. m = margin, a = area.